Well, here we are again. In the absence of Harry Potter and Twilight, it seems the one thing that gets fans of the young adult genre quivering with excitement each year is the latest instalment of Suzanne Collins’ monumentally successful Hunger Games series. Not quite ready to put the franchise to bed in 2014, the powers that be have decided to split the final novel adaptation in to two parts à la Deathly Hallows and Breaking Dawn. I cannot attest to any knowledge of the Twilight saga beyond the first film, but it was certainly the case in the Harry Potter cinematic universe that Deathly Hallows – Part 1 fell flat as an individual picture, instead acting purely as a prelude to the much more anticipated and enjoyable final chapter in Part 2. Would Mockingjay – Part 1 suffer a similar fate and fall short of stand alone brilliance, or could Jennifer Lawrence and co succeed in bucking the trend? In my humble opinion, Mockingjay – Part 1 possesses the very same faults and problems that are present in the example films mentioned above. The entire film feels very much like a ‘tweener’ episode in a thirteen part television drama, giving the audience small bites of interesting information and partial plot progression, yet ultimately feeling like a prelude to a greater conclusion further down the line. The narrative picks up shortly after the climax of Catching Fire, with Katniss (Jennifer Lawrence) having been rescued by Plutarch (Philip Seymour Hoffman) and taken to join the rebellion in District 13 whilst Peeta (Josh Hutcherson) is returned to the Capitol to be used a political pawn. 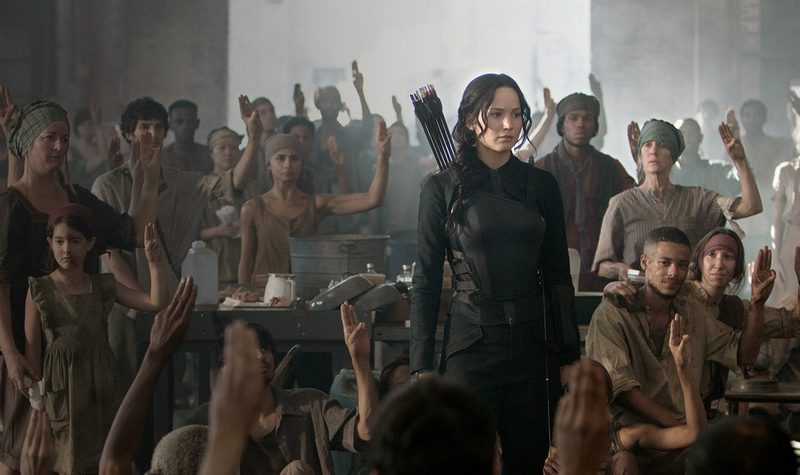 We are introduced to a number of new characters including Alma Coin (Julianne Moore), President of District 13, and the first half of the picture centres around efforts to turn Katniss in to the fully fledged figurehead of the rebel movement, with a number of scenes feeling like something out of a sci-fi West Wing, campaign planning and propaganda creating. The second half of the film picks up some satisfying pace when said campaign planning and propaganda creating are put in to motion, most notably during an inter District visit by Katniss to a civilian hospital that sparks a bitter and bloody battle with Capitol forces. However, as was the case in the first two series instalments, Mockingjay – Part 1 really comes to life during the moments concerning or displaying the relationship between Katniss and Peeta. Perhaps this comes through the familiarity and attachments that the audience have built with these characters over the years, but the film’s final fifteen minutes are undoubtedly its best, both reflecting just how average the rest of the picture is and just how exciting Mockingjay – Part 2 promises to be. Just as a gripping novel does not fully satisfy until the very end, so it follows suit that a two part film adaptation should play out in the same manner. As has come to be expected, Jennifer Lawrence continues to be excellent in the role of Katniss Everdeen just as she is excellent in every other role she plays. The integrity of one of modern cinema’s leading female characters could not be in safer hands. Lawrence expertly portrays the mix of inner strength, at times outward vulnerability and ultimate steel that defines Katniss as a character, and without wishing to sound like a broken record I really cannot picture any other young actress in the role. For perhaps the first time on a wider scale, Lawrence has a good quota of esteemed company with which to spar. The increased role of the late Philip Seymour Hoffman and the introduction of Julianne Moore give the film a certain mature dramatic depth that the series has perhaps lacked up to this point, and the scenes between the three actors are among some of the most enjoyable in the film. Though Josh Hutcherson contends with a lesser role than in previous instalments, his performance this time around as Peeta is undoubtedly his strongest and most evocative yet, making a huge impact with very little screen time and even managing to steal scenes from his enigmatic Academy Award winning female costar. Familiar faces and performances from the likes of Elizabeth Banks, Woody Harrelson, Liam Hemsworth and Donald Sutherland all help to keep the audience happy, though as usual it really is Jennifer Lawrence who carries much of the picture alone. 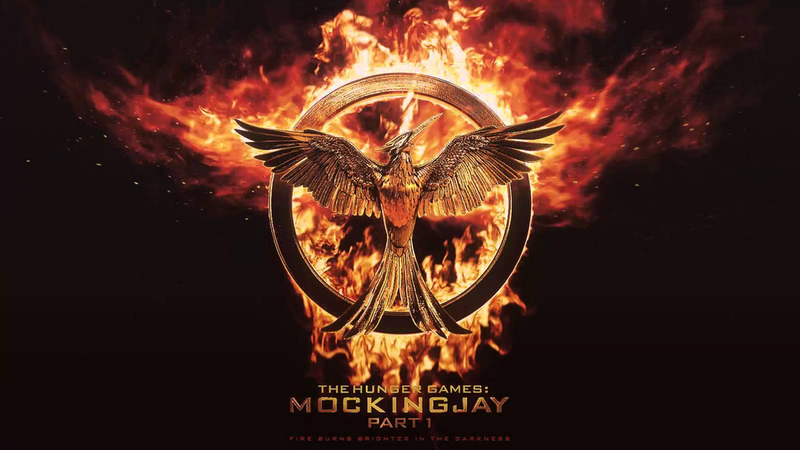 Overall, Mockingjay – Part 1 is a different feeling Hunger Games instalment to the previous series episodes. I have it on good authority that the film plays very true to the novel, and whilst this might please the purist book readers, I can’t help but feel that a two part finale only lends to bloating. I do not know what is to come in Part 2, but I am almost certain that a large amount of content portrayed in Part 1 will be found to be redundant to the overall narrative and therefore simply an exercise in franchise lengthening and box office honey. Reading this review back I fear I have been a little over harsh, Mockingjay – Part 1 is a fine furthering of the Hunger Games story, but I cannot shake the feeling that it is like the eighteen mile mark of a marathon, at this point you are over the comfortable and enjoyable running, not yet in to the adrenaline boosting home straight, but rather stuck treading water at the three quarter mark with only the hope of the finish line to keep you from quitting. You’re not overly harsh – I’m getting so sick of studios splitting movies in two. It causes the sort of narrative problems you mention above, i.e. lots of useless padding and treading water, and always seems motivated by money. There’s no real creative reason why a book this short with this kind of plot would need to be split up. Trilogy always sounds better than Quadrilogy… the studios are going crazy when it comes to ending a franchise. Sometimes it’s two-part finale, sometimes it’s another extension or spin-off, and sometimes it’s simply reboot! Gonna give it a miss while this one is in theatres… have already seen many this month. Great review btw.